The internet is saturated with video content. In most cases, people prefer to be shown rather than told. People also have very short attention spans and a bevy of advertisers and storytellers vying for their attention. There’s only so much time they can give to any piece of content. So, what’s the optimal length to keep a viewer’s attention? Most cases studies and analytics suggest that 2:00 is the sweet spot for all online video. After that, engagement drops off steadily. But in actuality, the length of a video should vary by platform and intention. Sure, you can play the numbers game. No more than 2:00 for video, no more than :15 for pre-roll, and so on. But humans aren’t robots; we aren’t programmed to watch something for a designated amount of time. We watch videos that we find interesting. 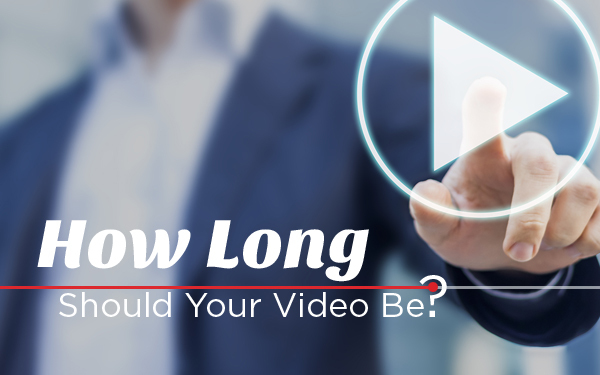 In our opinion, you can throw out all those suggestions and so-called “best practices” surrounding video length. Except for one: you really do only have :10 to grab your viewers’ attention. Smart marketers know that there’s no one-size-fits-all approach to anything in the advertising world, and that includes video length. Our main goal isn’t to satisfy some algorithm or trivial benchmark. Our goal is to produce quality content that people actually want to watch. If what you’re showing your audience isn’t relevant or good, it’s not going to matter whether it’s :05 long or a full-length feature film. The long and short of it is (see what we did there?) that there is no magic number, no hard and fast rule. Abraham Lincoln was once asked how long a man’s legs should be, and famously replied that they should be “long enough to reach the ground.” The same goes for your next video: it should be long enough to tell your story. And good enough to keep your viewers’ attention. Take some time to see what our video department can do.